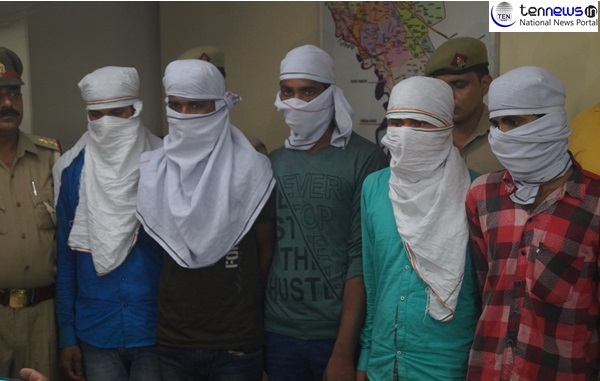 In a major breakthrough yesterday night Noida police had arrested five smugglers with 100 kg of marijuana while they were on their way with the consignment. Acting on the tip of a team sector 20 police arrested the smugglers from DM roundabout during the checking drive while a commuting in a car. Police had recovered 100 kg of Marijuana, Rupees 10 thousand cash accumulated through smuggling, 4 country made gun with 8 live cartridges, maruti SX4 and 5 mobiles. All the accused were identified as Dhramraj, Deepak Yadav, Kalu Yadav , Amit Kumar, Rocky Kumar all residents of Khagaria Bihar. SSP GBN DrAjay Pal Sharma told that “while sector 20 police SHO Jayveer Singh with his team was conducting a routine checking drive at Rajani Gandha roundabout. He got a tip that five men from Bihar with a consignment of Marijuana were on the way which will be latter supplied in different area of NCR. Acting over the information he alerted the police party and arrested the accused from the suspected car. The main customers of these smugglers are students and youths as the region is also an education hub. Police is still working to crack down their whole network and catching the master minds.